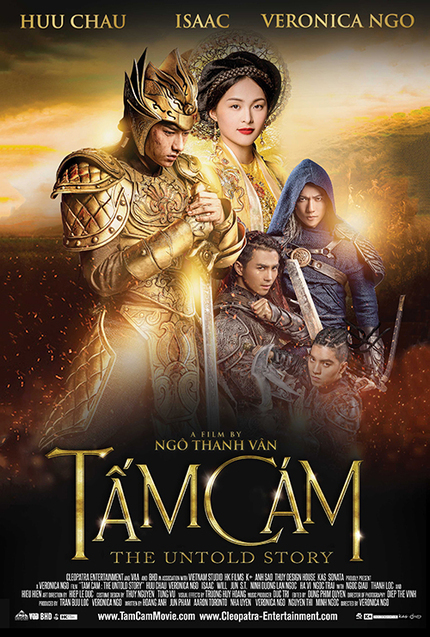 The top grossing film in Vietnam last year was Veronica Ngo’s action fantasy film Tam Cam The Untold Story. Her second film from the director’s chair has found its way to U.S. shores and will bow in cinemas in San Jose and Garden Grove, California from September 29th through October 5th. Screen Anarchy has been given an exclusive clip to share with you. It’s a modern, action-packed twist on a classic Vietnamese Cinderella tale of an apathetic Prince who finds enchantment in Tam, a kind and beautiful countryside girl. Things turn fatal when Tam gets trapped in the jealous machinations of her wicked stepmother and stepsister, and the Prince suffers from misplaced loyalty, putting his love, himself, and his kingdom in peril. Veronica Ngo made an impression with early roles in The Rebel and Clash with Johnny Nguyen. She can be seen in upcoming pics Star Wars the Last Jedi and Bright. So yes, Ngo is doing quite well thank you very much. And speaking of doing well, her directorial work on Tam Cam looks to be on par with the heavy hitters of fantasy epics like China. In an industry and genre dominated by men her film looks to have all the familiar elements: lavish costumes, large battles, decent action, deception and romance. Just based on what we have seen in this clip and the trailer alone her directorial work is right up with the boys. In the clip that we were given we do not know who all the characters are but it is a good example of the action we should expect to see and presents an emotional quandary for the Prince who is about to be presented a chorus of ladies, from which one may become his wife. Have a look for yourself. We have included the trailer as well. Enjoy.